Hometown: Willingboro, New Jersey, U.S.
Died: June 24, 2008 in Operation Iraqi Freedom. Unit: Army, 432nd Civil Affairs Battalion. A viewing will be held for Maj. Dwayne M. Kelley at New Hope Baptist Church, 144 Norman Street, East Orange, N.J., from 5 to 9 p.m. on Tuesday, July 1 with Masonic Ritualistic Services to be held between 7 and 8 p.m.
A viewing will also be held at Tabernacle Baptist Church, 150 East Second Street, Burlington, N.J., on Thursday, July 3 from 9 to 11 a.m. The funeral service will follow immediately afterward at Tabernacle Baptist Church. Following the funeral service, he will be buried with full military honors at Odd Fellows Cemetery, Route 130 South, in Beverly, N.J.
Our family is very saddened and our hearts are filled with grief. Dwayne was a dedicated and generous person who loved his family and was devoted to serving our nation. We are proud of his courage and his service. Dwayne will always be a hero to us and he will be sorely missed by his family and by his many friends. 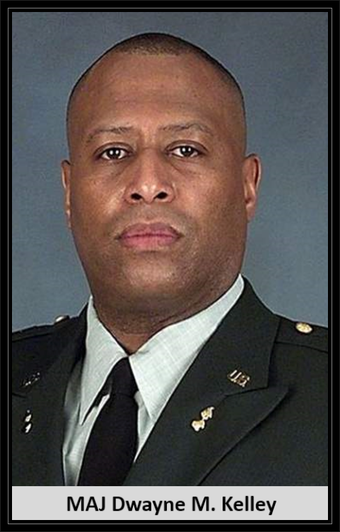 Major Dwayne M. Kelley, 48, was a civil affairs officer assigned to the 432nd Civil Affairs Battalion, Headquarters and Headquarters Company, stationed in Green Bay, Wis. He entered the Army in February 1978, and served for three years as a light wheel vehicle mechanic until February 1981. From 1982 to 1985, Maj. Kelley completed his studies at Rutgers University, earning a bachelor’s degree in Psychology. He graduated in May of 1985 from the ROTC program, earning his commission as a U.S. Army Reserve second lieutenant in the Ordnance branch. Major Kelley served as an ordnance officer from his graduation until 1999, when he changed his military occupational specialty to military police. He served as the Headquarters and Headquarters Company Commander for the 2nd Battalion of the 309th Regiment, Fort Dix, N.J., from April 1999 until April 2001. He was mobilized as a military police officer in October 2001 shortly after Sept. 11, 2001 in support of Operation Noble Eagle. He served two years, with the 2nd Battalion of the 309th Regiment, 5th Brigade, 78th Division (Training Support) at Fort Dix, N.J.
Major Kelley became a Civil Affairs officer in October 2004 and was reassigned to the 404th Civil Affairs Battalion at Fort Dix, N.J., serving as the unit’s executive officer. In 2005, he became the assistant plans officer assigned to the 353rd Civil Affairs Command, Staten Island, N.Y. Maj. Kelley served in this position until his second mobilization in November 2007 with the 432nd Civil Affairs Battalion, Green Bay, Wis., where he was serving as their Civil Affairs Team Chief. His military awards included two Army Reserve Components Achievement Medals, National Defense Service Medal, Armed Forces Service Medal, the Armed Forces Reserve Medal with bronze hourglass and with “M” (mobilization) device and the Army Service Ribbon. 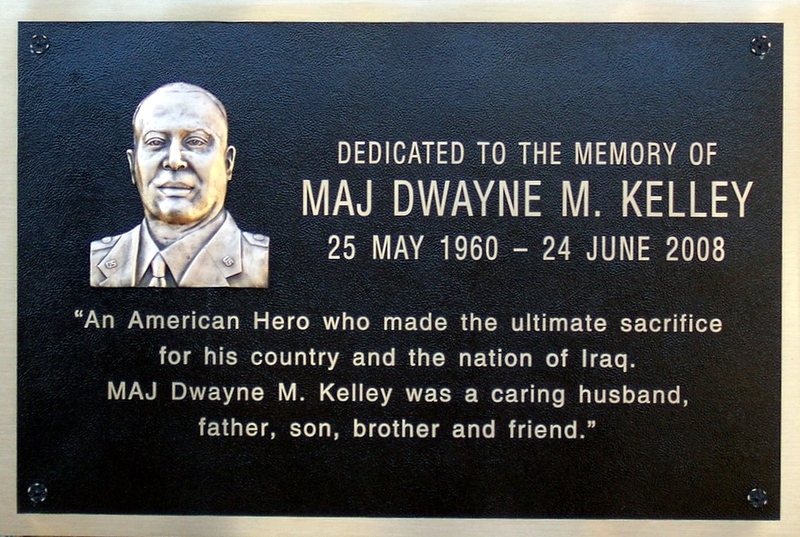 Major Kelley is survived by his wife, Manita Kelley, and his daughter, Mushirah Kelley, South Orange, N.J.; by his mother, Vera Kelley, Willingboro, N.J.; by his sister Sabrina and brother-in-law David Dalton, Montclair, N.J.; and by his brother, Michael Kelley and sister-in-law Ruth Kelley, Kissimmee, Fla.. He was born in Brooklyn, N.Y., in 1960; is a graduate of John F. Kennedy High School, Willingboro, N.J.; and holds a bachelor’s degree in Business Administration from Rutgers University. 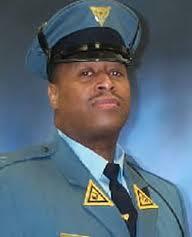 Major Kelley also was employed by the New Jersey State Police as a Detective Sergeant First Class. Detective Sergeant First Class Dwayne Kelley #4806 began his career with the New Jersey State Police on Feb. 25,1988, as a graduate of the 110th State Police Class. He served as a Road Trooper in Troops “C” and “D” with assignments at Wilburtha and Fort Dix Stations before being assigned to New Brunswick Station in 1989. While assigned to Troop “D” he also served at Moorestown and Newark Stations on the New Jersey Turnpike. During his tenure on the New Jersey Turnpike, he also served in the Construction Unit. Detective Sergeant First Class Kelley was selected for the Investigations Section in March of 1999, where he was assigned to serve in the Auto Unit. He was promoted to Detective Sergeant in December of 2004 while in the Auto Unit-North. He was then transferred to the Counter Terrorism Bureau, Joint Terrorism Task Force-North in October 2005. In July 2007, he was transferred into the position of Bureau Administrative Officer for the Counter Terrorism Bureau and promoted to Detective Sergeant First Class in January 2008. During his career, Detective Sergeant First Class Kelley received numerous awards and commendations. Most recently he received the 2006 Essex County Executive Extraordinary Valor Award. He also received a 200 Club of Essex County Valor Award in 2007 for his 60-day detachment to Guantanamo Bay Cuba. This award was for his role as a member of the New Jersey State Police, Joint Terrorism Task Force. He was awarded for the role he played by interviewing terrorism detainees who posed a threat to National Security. Detective Sergeant First Class Kelley’s service with the New Jersey State Police was characterized by loyalty, fearless performance of duty and faithful and energetic devotion to the highest principles of the New Jersey State Police. Besides his dedicated service as a soldier and with the State Police, he also enjoyed several hobbies including basketball and masonry and sharing time with his family.